A new way to spread gratitude by sending thanks to your friends. Do you remember the last time you received a handwritten Thank You note? It’s something that brings a uniquely wonderful feeling that tends to linger. Maybe you even keep a few favoites. Saying “thank you” is a simple and powerful way to spread joy to others. 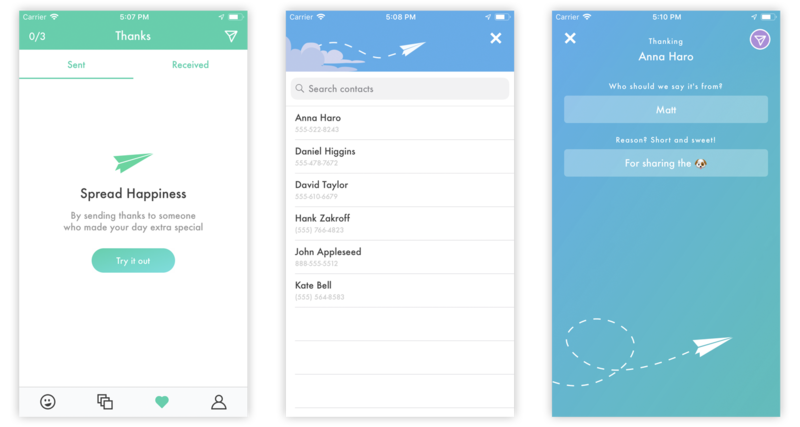 We’ve always wanted to build a way to send thanks in our app. Wellness blogs and positive psychologists often mention gratitude and thanking as two of the best practices for fostering happiness. We wanted to branch out and try another important practice. Happyfeed is a place to find more happiness, not just a gratitude journal app. Thanking is the first time we’ve stepped out of our gratitude-only comfort zone! Note: We are launching in the US only, but we plan to expand soon. This is due to the technical difficulty of sending messages outside of the US. The UK, Canada, and Australia are next up! We thought about tagging friends in posts, sending out emails, and even mailing out postcards for you to forward along. After years of conversations and pondering, we decided the easiest solution would be to send them via SMS. Mailing seemed like too much work to start, and email felt too spammy and stressful. Plus, texting is one of the main things we use our phones for. It felt right. 😛 Emoji reactions - We love emojis because they are (1) easy to send and (2) convey a lot of meaning. A random 🐢 emoji may trigger fond memories years later. ⏰ Time-based - Each thank is attached to the day it was sent. We plan to explore ways to show thanks on other pages, like the calendar or memories. 👭 Connections - Each thank is associated with a phone number and grouped together. This gives you a private history of your gratitude and relationships. 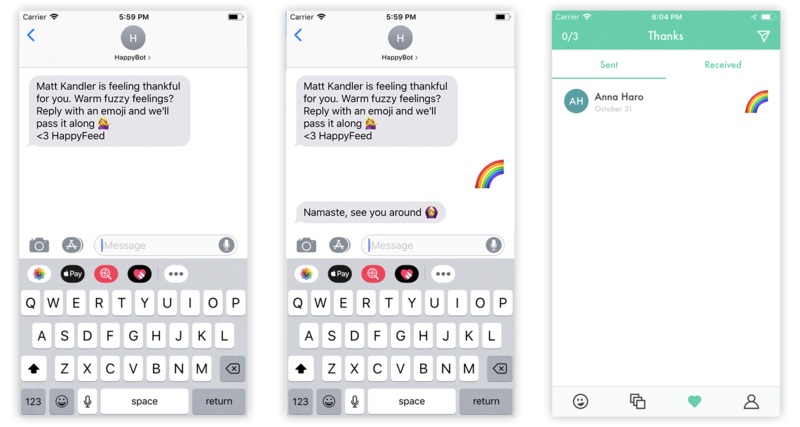 We can’t wait to see how you use thanking in Happyfeed. If it proves useful, we have a few ideas we are excited to pursue - things to evolve the nature of how to associate friends with gratitude. For example, someday you might be able to optionally trigger a thank in the future by tagging a friend on a moment. One of the things we love most about Happyfeed is that it’s 100% private. You can happily post moments that feel special to you without worrying about the opinion of others. Thanking is “semi-social” in that it does connect you with others, but your journal will always be private and personal. We were careful to create a system that maintains full privacy - part of why we use phone numbers to send and receive thanks. Your journal will always be private. No matter how happy you can be on your own, you can always be happier with others. Thanking is a reminder that mental wellness is a shared journey.